Otherwise known as Freedom Tower, One World Trade Center is a beacon of resilience and of hope. Freedom Tower is the rebuilt World Trade Center which was devastated in the terrorist attack of September 11, 2001. It is an important landmark not only in New York City but in the United States as a whole because of what happened there, because of what its rebuilding shows the rest of the world - that terrorism will never win. Students traveling to New York City will benefit from a visit to Freedom Tower. 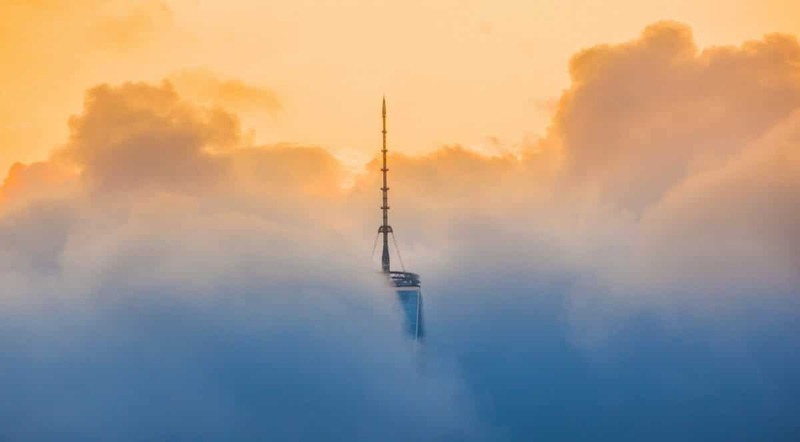 Perhaps best for upper middle school and high school students, visitors to One World Trade Center will be inundated with the history of the attack on 9/11 even as they are rewarded with incredible views from the observatory. Teachers, the One World Observatory was built to illuminate the past and showcase the beauty and hope of the future through exhibits, a theater and 360 degree views of the nation's largest city. When you arrive, you're greeted with the salutations of a number of international languages. You'll also notice a large computerized map of the world which will spotlight the hometowns of visitors. Here you'll have the option to continue through the exhibits or to go straight up to the observatory. Voices and Foundations are the main educational areas, the first telling about the men and women who built Freedom Tower while the latter lets guests explore the very literal foundation of the building. Discover the incredible heights and challenges which the builders faced and conquered, in the end creating the tallest building in New York at 1,776 feet (1,792 with the spire) and 104 floors plus five underground. Visiting students will then have the opportunity to be rocketed up the building to the observatory itself. This building is the tallest in the Western Hemisphere, the fourth tallest in the world, and you reach the top via elevator in under sixty seconds. The elevators are surrounded by visual displays and act as secondary observatories as you see the entire city falling beneath your feet while you travel at incredible speeds up to the 102nd floor. But it's not just any city. It's New York evolving from the 1500s to the present day, getting older with every floor you ascend until you reach the glorious peak and modern times. The visual displays act like true windows and your students will marvel at the show and technology as well as all the history evident in New York City. But the elevators aren't the true show. Disembark the elevators on the 100th floor and find the One World Observatory, an observation deck to rival that of the Empire State Building. 360 degree views greet you and you're able to look down on the entire city from 1,254 feet in the air. Spot the Empire State Building and the Statue of Liberty, Central Park and Times Square from a single position and marvel at the architectural beauty, the human ingenuity of it all. The Sky Portal is also included in the main observatory and features a 14-foot wide circular disc which, as they say, delivers unforgettable views using real-time digital footage of the streets of New York. Technology and connectivity are truly united in this amazing building, making it the top of the line in both architecture and amenities. While you're at the top, stop by the See Forever Theater which combines unique shots of the city and its people, both video and photographs, in time lapse and real time. See Forever shows the lifeblood of the city, the vivacity and passion of its people, highlighting the real reasons why New York will always rebuild after a disaster. Also, you may visit City Pulse, a state of the art exhibit which allows guests to interact with the city's landmarks using gesture recognition, summoning imagery, and even recommendations for curious visitors. If, by the end of your tour, your group still wants more time exploring, One World Trade Center also maintains unique dining and shopping experiences through the gift shop and gallery plus three dining options on the 101st floor. While the historic tragedy of 9/11 may be too graphic and terrible for younger students, the One World Observatory is still a beautiful attraction with plenty of educational value for all ages. Really, the most important thing to learn about One World Trade Center is that goodness, hope, and perseverance will never bow down to terrorism and that from the ashes of devastation, something incredible was created. The United States and its fellow countries must stand together to create "One World," to provide a better future for the next generation.